How do you measure spirit? Is it in the way a side responds to adversity during a cut-throat preliminary final? Or is it the way in which a club that has endured a 37-year senior premiership drought comes together as one to celebrate reaching another grand final? The Demons last experienced the sweet taste of senior premiership glory in 1981 – when they had the seniors, reserves, and thirds all make it through to the decider and win. This coming Saturday at Garfield, they’ll have the seniors, reserves, and fourths representing the club on the big stage. It’s an incredible piece of symmetry, but nothing more at this point. No one from Denhams Road is getting carried away with what the senior side achieved on Saturday in the preliminary final against their great rival, Nar Nar Goon. They simply can’t afford to. The last time the Demons made it to the final day of the season, in 2014 in the EDFL, they came up against a Cora Lynn buzz-saw that tore through them like a hot knife through butter. On Saturday arguably the two biggest clubs in the West Gippsland Football Netball Competition came head-to-head in front of a bumper crowd at Beswick Street. Cars lined the surrounding streets as footy fans flocked to the ground to watch these two famous old foes go toe-to-toe. Throughout the clash there were uncharacteristic fumbles from players of both sides, wayward shots on goal, and missed targets by foot. It all pointed to the pressure of the occasion. Demons star, and WGFNC Team of the Year member, Luke Walker couldn’t get up for the clash with a soft tissue concern, while in the first quarter his great mate – and former SEFNL league best and fairest winner – Dom Paynter went down with what looked to be a serious knee injury. The pair was later joined on the bench by ruckman Rory Connelly and tough-minded defender Brad Harding. It’s the kind of situation in previous seasons that might have proved too much for the Demons to overcome, particularly on a fast deck against a side known for its attacking flair and running ability. It wasn’t until nearly 12 minutes into the contest that the first goal was slotted – by a quick-thinking Nathan Voss, who ran around the man on the mark to slot a clever goal from inside 50. The implied pressure throughout the first term was particularly noticeable – with mistakes aplenty. Jake Smith and Tom Dovaston goaled late in the term for the Goon to give their side a narrow four-point lead at the first change, and it was the same margin they carried into the main break. Demons star Dave Collins, one of the highest-credentialed midfielders the Gazette Football liftout has covered at local level, looked made for the occasion – tough, hard, and unflinching he just continued to will his side into the contest. Younger brother Mitch was also having a significant impact forward of the centre, while Ben Kerrigan’s reputation as a clearance bull was once again shown to be well-earned. But a remarkable snap goal got the Goon going early in the second term and gave the side an 11-point lead in the low-scoring battle. Dovaston was causing the Demons’ defenders some real headaches up forward, but wasn’t able to capitalise on his work. But ultimately it was in that part of the ground that the Demons made their biggest impression when it counted most. Brodie Yapp and skipper Tim Miller maintained their composure and their focus on the task at hand – often putting their bodies on the line in the process – while Caleb Milojevic and Troy Dolan also excelled in their defensive midfield roles. But a Matt Stevens goal from outside 50 midway through the second had the Goon up three goals. Their run and dare, in the stages in which they did take the game on, seemed to have the Demons on the back foot and searching for answers – particularly between the 50-metre arcs. It was the Goon that had the numbers around the ball, and it was the Goon that seemed that little bit more switched on at the contest. But two late goals in the second – to Nathan Voss with a dribbler, and Nathan Lieshout with a long bomb on the run from 50 after receiving a handball from Bailey Galante (who was never looking to take the shot, himself) gave the Goon real cause for concern. They’d had much of the play for the first half, but lapses of five or six minutes proved incredibly costly as they were unable to capitalise on the momentum they’d earned. 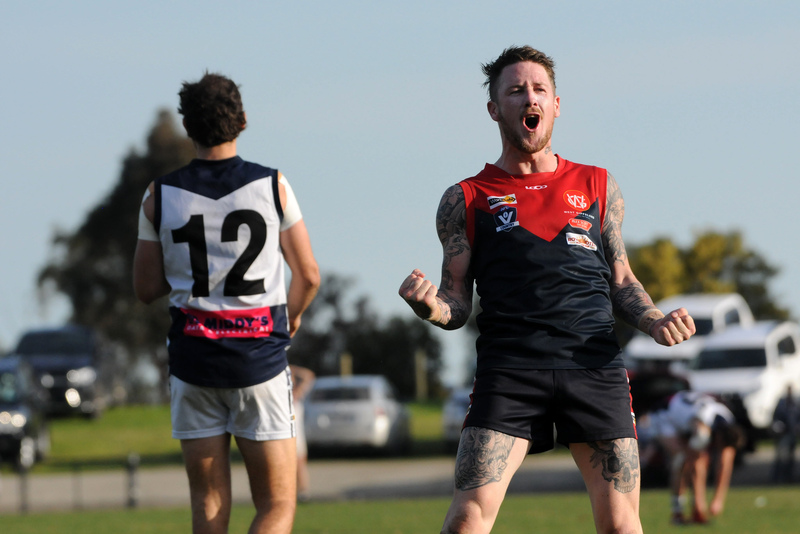 Todd Beck, Troy Toussaint and Trent Armour were particularly strong for the Goon, as was Sam Blackwood and full-back Daniel Battaglin, but as the second half progressed the class of the Demons took hold. Anthony Giuliano’s second half was particularly telling, as were some of the clutch goals Jason Wells nailed right when his side needed them the most. But it was Nathan Muratore who hard arguably his biggest impact on a game in 2018. Back to his dominant role off a half-back, he lifted right when the biggest moments arrived. Goals to Jason Wells and Mitch Collins early in the last had the Demons’ lead out to 14 points before Harding was forced from the field following a sickening collision. Then the call went out to the Demons – to play the percentages and not take unnecessary risks. But could they hold on? With the Goon daring to win, and Koowee seemingly slowing down as they reached the finish line, this clash fittingly came down to the closing stages. It wasn’t until an absolute bullet, 35-metre pass from Luke McMaster to Wells – who kicked truly at around the 21-minute mark – that the game looked decided. At that stage, some Demons fans around the ground had tears welling in their eyes as it dawned that their boys had another, rare opportunity to snap that 37-year drought. The task gets no bigger next Saturday – back at Garfield against a red-hot Phillip Island who defeated them earlier in this finals series on a heavy deck at Cora Lynn. But that’s all in the past, just like 1981. All that matters to the Demons now is the task at hand – and standing up when the moment arrives, just like they did against the Goon.